The feeling of accomplishment when Overcoming your fears in Skydiving is indescribable. Simply Put: There’s a lot more to a tandem skydive! Ask yourself this: what have you done lately that’s made you feel incredibly alive and vibrant? 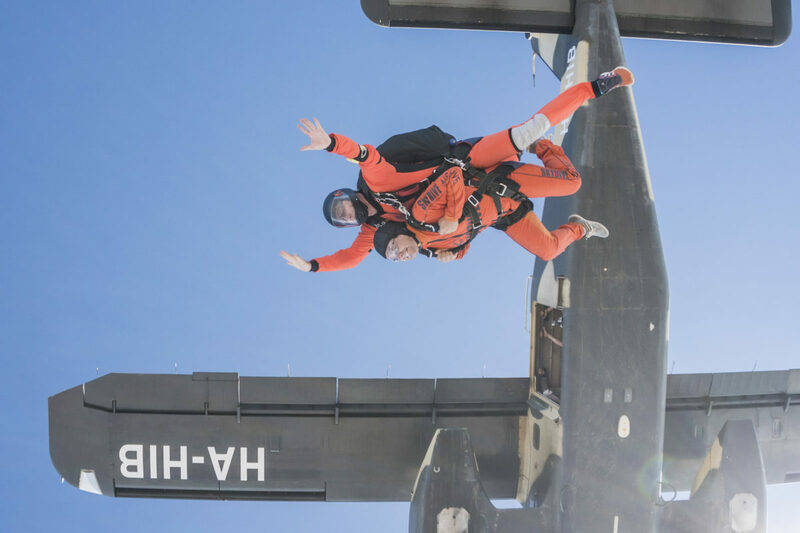 Imagine, you’ve signed up for your tandem skydive, the day has arrived and you’re questioning yourself as to why you ever decided to do this in the first place? You are SCARED and this is normal! Just the idea of sitting at the open door of an aeroplane, looking out and knowing you’re about to leap out that door is far from the realms of normality. But, you’re going ahead with this. It’s been on your bucket list for too many years and something, somewhere in your head is pushing you to do this! You will work on overcoming your fears in skydiving! You’ve arrived at the airfield in Alvor, ready for your skydive. Fears be darned as you look out onto the landing area and see skydivers raining down out of the sky, landing one after the other, gently touching back to earth. This sight is such a spectacle and you swallow down the fear as you proceed down the way to the hangar. When you arrive at the bright orange hangar you are led to the briefing room for the tandem skydive where you are introduced to your instructor, who is friendly and welcoming and straight away you feel at ease. Their warmth and reassurance is infectious. You watch the briefing video taking in all the instructions that are given, such as head back at exit, hands placed on your harness in front of your chest. Well, this sounds easy enough! As the minutes pass you are feeling more and more excited but still a little anxious. You dress into the bright orange skydiving suit, test out some goggles for size and are given a soft helmet. Your instructor brings over your harness and helps you step into it and adjusts the straps to fit you comfortably. Game on! Overcoming your fears in skydiving is easily done by choosing the right place to skydive! Your time to board the plane arrives! Your tandem instructor leads you to the aircraft door and you feel like you’re marching off to battle. The battle of nerves. You against fear. At the door of the plane you feel the rush of wind from the prop just as you climb in. The noise of the plane is impressive! You crawl along the bench following your instructor and sit in front of him with your camera man nearby. It’s a tight squeeze in the plane as more skydivers board the aircraft and get seated in front of you, all smiles as the whole plane load gets ready to go do something incredible. Within seconds everyone is onboard, the door is being closed and the aeroplane is taxiing towards the runway. Before you know it, the plane is accelerating picking up speed and the wheels are lifting up off the ground. You think to yourself- This is it! There really is no going back now! The comradery on the plane, on the way up to altitude is inspiring. Somehow all of these strangers have given you a sense of belonging as they high five you, and give you a look like “You’re going to love it!” Suddenly you realise this is like nothing else you’ve experienced before in life. As the altitude nears 15,000 feet there seems to be a ritual of fist bumps and special handshakes and encouraging hand signals to one another (yourself included) and even though this is all new to you, you realise you’ve just became a member of a special club. Even with the lighthearted fun, there’s a definite sense of seriousness and focus as each of the skydivers check the altitude on their wrists and do last minute checks and double checks of their equipment. Pretty soon the door is being opened and the plane seems to slow down and the first skydivers are getting ready at the door. You watch and, all of a sudden the group at the door have disappeared! In the blink of an eye, the groups take to the door and are gone from sight as they enter the sky for what’s to be a minute of complete freedom and fun. As the others on the plane take their turns to exit, your tandem instructor is motioning you to shuffle back down the bench. As you and your instructor prepare your exit position, you feel the cold air and glance down. For the first time you realise the view is absolutely out of this world, The coastline stretches as far as the eye can see. The blue of the sea mixing with the blue of the sky. Your life and everything you have in it is rushing through your mind and you feel an overwhelming sense of appreciation. They didn’t tell you this would happen, did they! It’s so much more than an adrenaline rush! After the minute of freefall, you feel a change in speed and position as your instructor pulls open the parachute and it opens gently above you both. Your instructor slackens off your harness a bit, releasing the tension from him, and checking all of the equipment and parachute. He shouts to you to pull down your goggles and you do so. It’s a strange but exhilarating feeling to be hanging under this large parachute, slowing floating and drifting around the blue sky. Looking around at the vastness of everything around you below, you recognise Portimao, Alvor, Lagos, the Portugal coastline, and from all the way up there you feel a small sense of being. Again the feeling of appreciation for everything that IS comes over you. The parachute ride is so peaceful and calm- a complete contrast to the freefall. You feel a mix of emotions that you can’t say you’ve ever felt before. As the ground is nearing you’re asked to practice lifting up your legs for the landing. Your instructor is expertly maneuvering you to the direction of the landing area, directly in front of the hangar where you started from. As you get closer, the ground seems to rush up towards you and you’re soon sliding to a halt on your bum and the parachute comes to a land behind you. You are laughing with joy inside at what you’ve just experienced. Your instructor unclips you and you both stand up. After hugs and high fives, you notice the huge smile on your instructors face too. At this point you realise how much they love their job and the feeling of satisfaction they get at having introduced you to their amazing sport for the first time. 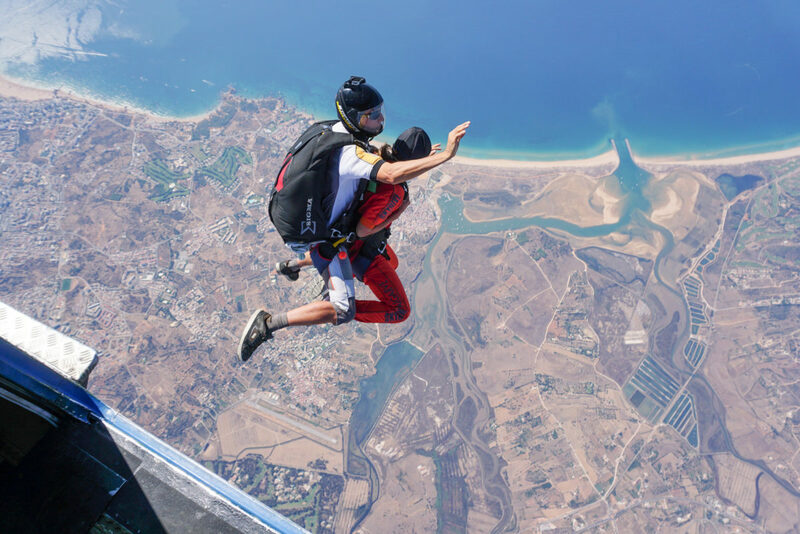 Skydive Algarve are a family of three dropzones, including Skydive Spain and Skydive Hibaldstow.